May- Scott Shaheen purchased parts and made repairs to the kitchen equipment in the church. 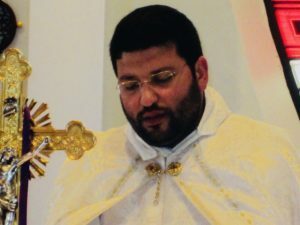 June 26- The ordination of Tony Massad to the priesthood. July – Mid East Festival. July 18- Abbott Semann Abou Abdou, the superior General of the Mariamite Maronite Order will honor us by presiding over our services. September– Scott Shaheen volunteered his time and talents to install our new double convection oven in the hall kitchen. September 14- Archbishop Francis Zayek—1920-2010. Feb 12- St. Maron Feast-Bishop, Earl Boyea, of the Catholic Diocese of Lansing came and officiated at mass and shared in the ceremonies. Mr. Joseph Faris, a founding member, of our parish was present with the Silver Massabki Award. July 12- Repairs to the roof of the sacristy are nearly finished. July- Scott Shaheen donated parts and made repairs to the fountain used in the pond by the rectory. September 5- MSGR. Ron N. Beshara, former pastor, passed away at age 66. October- New Altar Shelves on each side of the Altar were donated and built by Joseph & Elias Joubran. October 11- Fr. Abbot Boutrous Tarabay, Superior General of the Maronite Mariamite Order, took time from his busy schedule to celebrate mass here at Our Lady of Lebanon Parish. 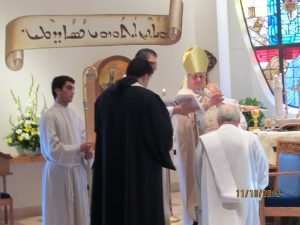 October 23-Arrival of our new priest Fr. Paul Tarabay and the departure of Fr. Hanna Tayar. March 21-Bishop John Chedid passed away (1923-2012). 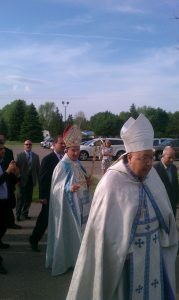 May 15- A visit from our Patriarch to OLOL- His Beatitude Mar Bechara Peter Rai. May- A visit from Father Mitch Pacwa, host of EWTN’s program Threshold of Hope. August- Paving of our parking lot. November 11- Orientation of Joseph Pavlovich to Sub-Deacon. March- Arrival of our new temporary priest Msg. 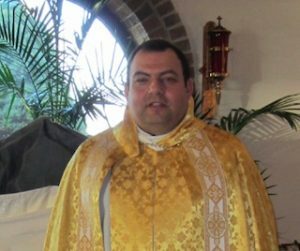 Ignace Sadek and the departure of Fr Paul Tarabay. June-Arrival of our new priest Fr. Pierre Bassil and the departure of Msg. Ignace Sadek. October- Rosary for America needs Fatima- held in front of OLOL. January- Received new copier/printer machine. May- Our Lady’s courtyard got new shrubbery and pine trees. Along with an overhaul of the goldfish pond and the addition of new flowers. September 17- Interfaith Prayer Service –praying for the unity of Christians throughout the world. September- Public Square Rosary Crusade: publicly pray to end the threats to the nation and the world. October 25- First Pastoral Visit of Bishop A. Elias Zaidan with special guests Bishop Frank Kalabat of the Detroit Chaldean Church and Bishop Earl Boyea of the Lansing Diocese and a dinner was held. October 26- Our New Bishop celebrated the 10:00 a.m. Liturgy. A complimentary all parish reception was held after Liturgy. October 30-31- The Holy Relics of Saint Rafka visited our church. January-Parishioner Vikki Haley becomes a judge. March- Eric Lindhurst, Danny Zerka and Scott Shaheen installed new LED lighting in the Church. 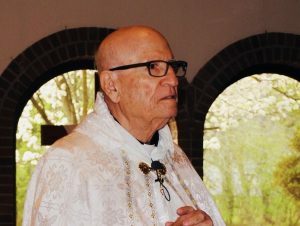 April 14-Former pastor Msgr. Ignace Sadek passed away. August- Aida Hayek and Tyl Rizik donated two new statues to our church. The statues are of Saint Jude and Saint Sharbel. October 10- OLOL hosted a Public Square Rosary Crusade to ask for the help of Our Lady of Fatima, to ask God’s blessings on our nation, and to make reparation for public offenses against God. November 14-16- The Holy Relics of our beloved Saint Sharbel visited our church. May 15- We welcomed Bishop Elias Zaidan on his second visit to our parish. He celebrated first communion for our children. May- Mr. and Mrs. Michael Joubran donated a new “Digital Sign” in front of our church. This was given to the parish in memory of his father and mother, Tom & Julia Joubran. July-Vivian Mansour & Vivian Andoian donated flowers, mulch, and stones to landscape around the digital sign. September 21-Monsignor David George, former pastor, celebrated his 40th anniversary of Ordination to the priesthood. November 10-13- Bishop Zaidan made a pastoral visit to our parish. December 17– Christmas Retreat day given by Fr. Roy Horning (Pastor of Holy Rosary). January– New roof install on classroom wing. New hot water heater installed. April 7-Fr Roy Horning from Holy Rosary did a Lenten Retreat. 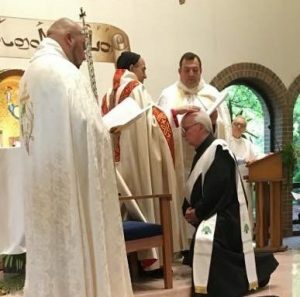 May6-7 Bishop Zaidan celebrates the ordination of Joe Pavlovich (from Sub Deacon to Deacon). May7 Bishop Zaidan celebrates First Communion for our children. November-Parking lot cracks were sealed and stucco repair to the outside of the stain glass area of the church. March 12-Right of Confession and Forgiveness Retreat with Fr. Youssef Mariam. March 30-31-Holy week Retreat with Fr. Armando Khoury. March- new furnace in Rectory.